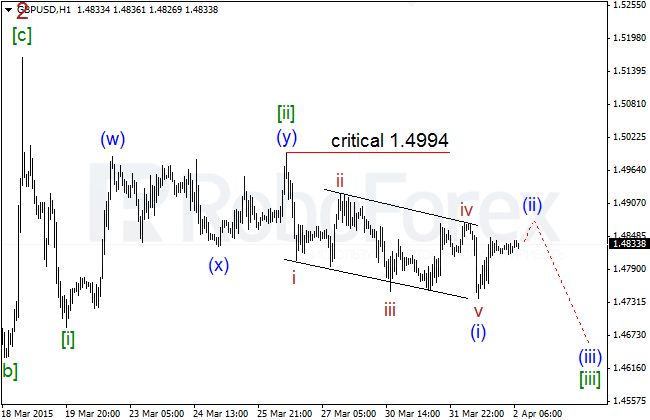 The market continues forming a descending impulse (v) of [iii] with a double extension inside it. 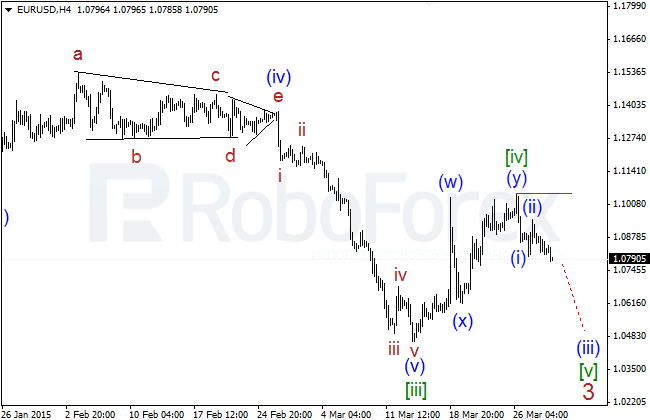 In the nearest future Euro is expected to continue falling and complete this whole structure. 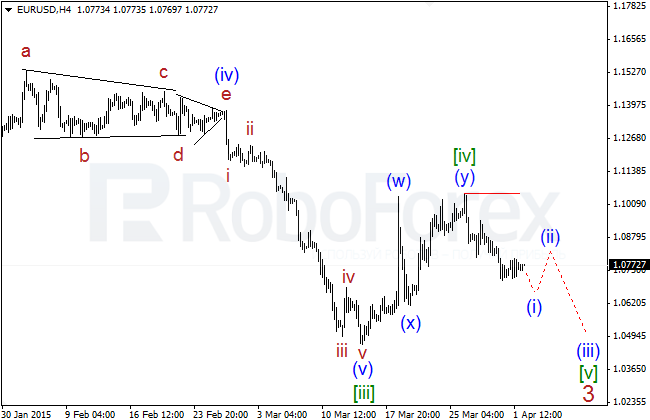 Probably, the price has finished wave iv of (v) of [iii]. 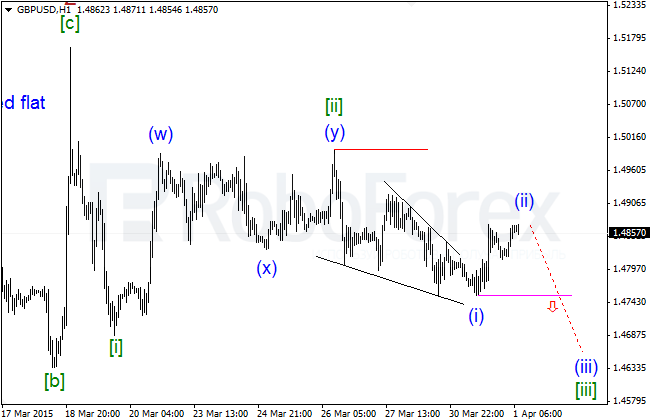 In the nearest future, the market is expected to reach a new local low and stay below 1.0450. 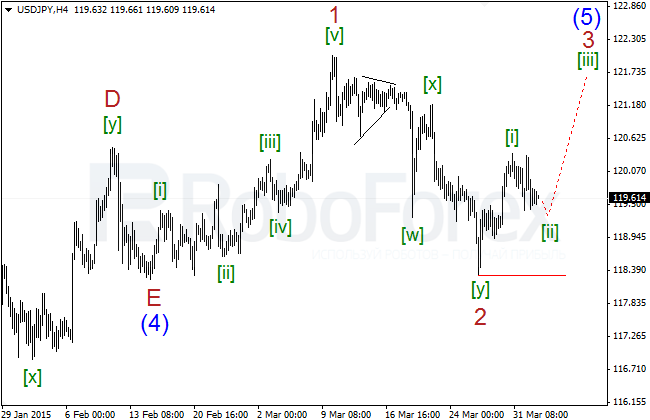 Pound is still forming a large descending impulse 5 of (1), which lacks one more five-wave descending structure inside it. 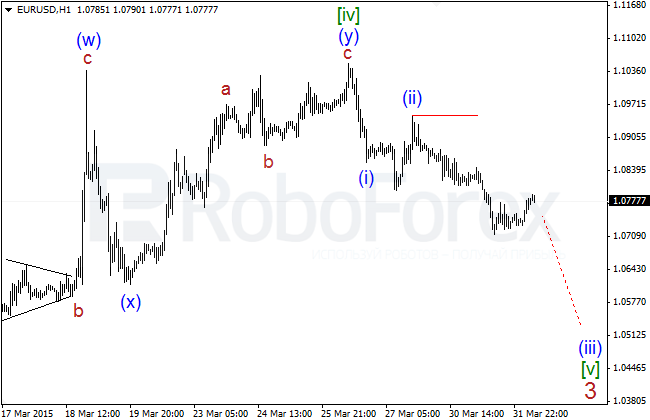 In the near term, the pair is expected to continue falling and reach a new local low. 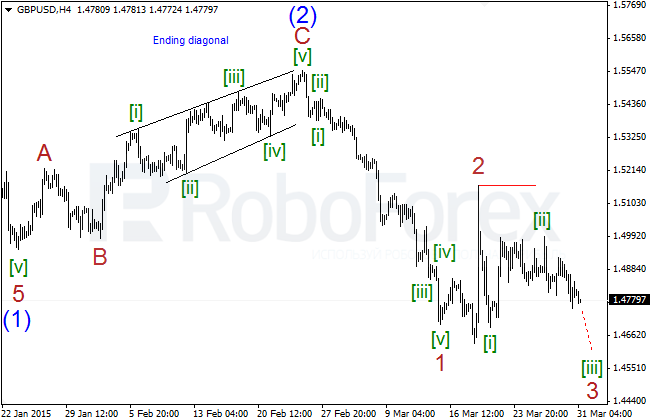 Most likely, the market has finished wave [iv] of 5 of (1) in the form of zigzag. 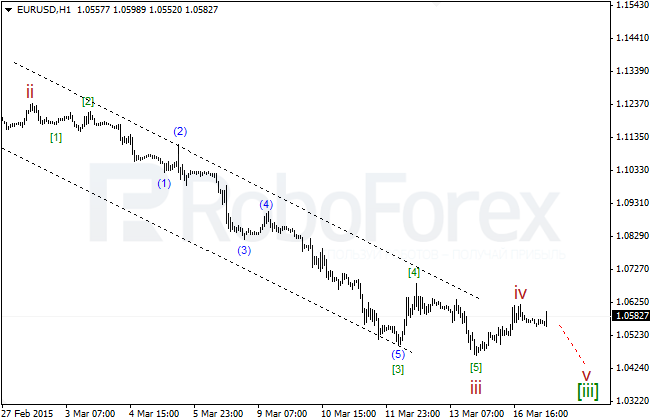 In the nearest suture, the price is expected to continue moving downwards inside a descending channel. 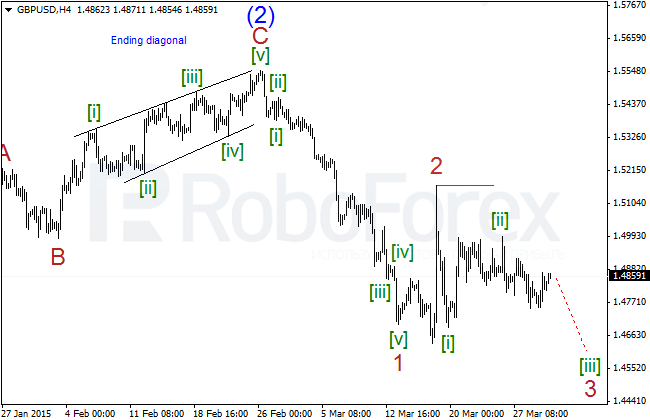 The price is moving sideways, so we have to change the structure of wave 4 of (5) of , which may be taking the form of horizontal triangle. 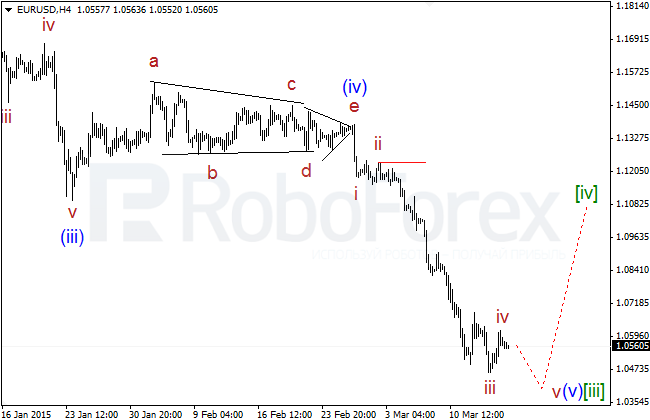 In the nearest future, the market may continue growing and form wave 5 of (5) of . 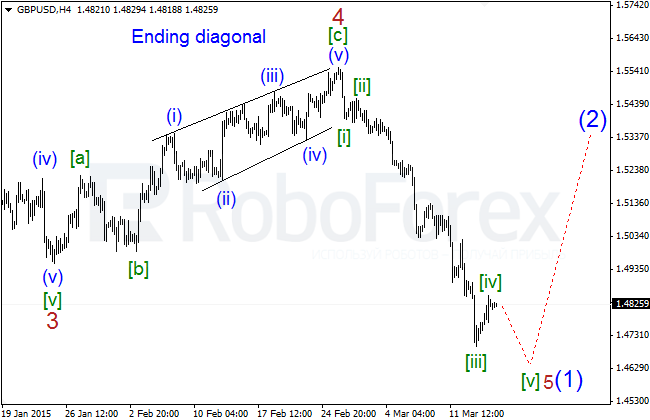 Most likely, the pair is forming a descending zigzag [e] of 4 of (5) inside horizontal triangle 4 of (5) of . In the nearest future, the pair is expected to complete this whole structure and continue growing. 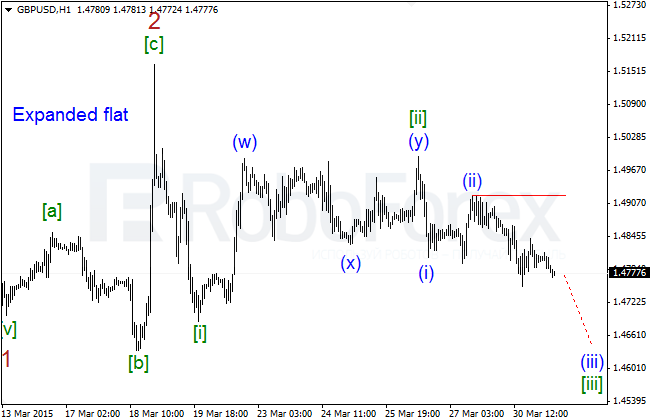 The structure of the current ascending impulse is quite unclear. 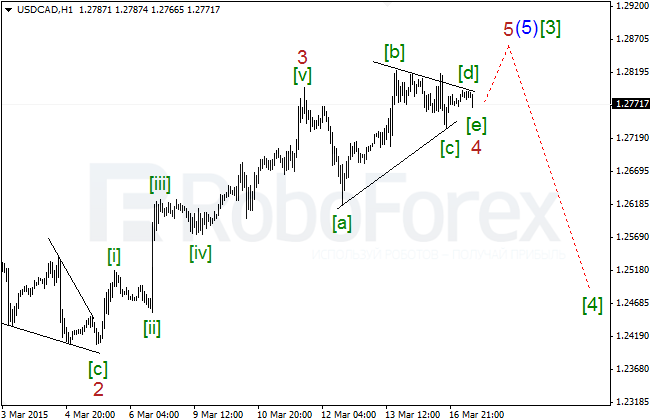 One of the possible scenarios implies that the pair is forming running triangle inside wave 4 of (5) of , after which it may continue growing. 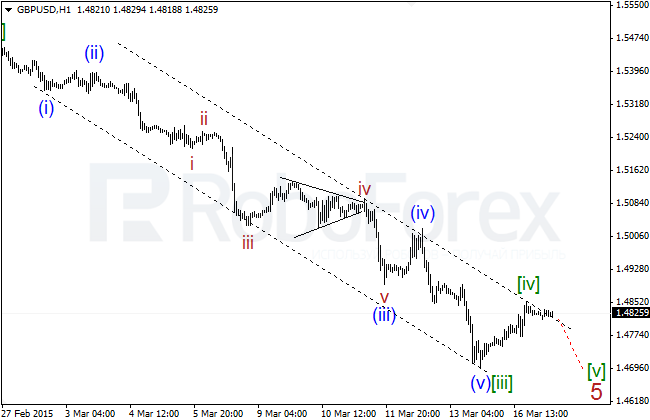 The correction inside wave 2 of (5) of  is quite complicated and long, that’s why we can say that the price is forming running triangle inside wave 4 of (5) of . 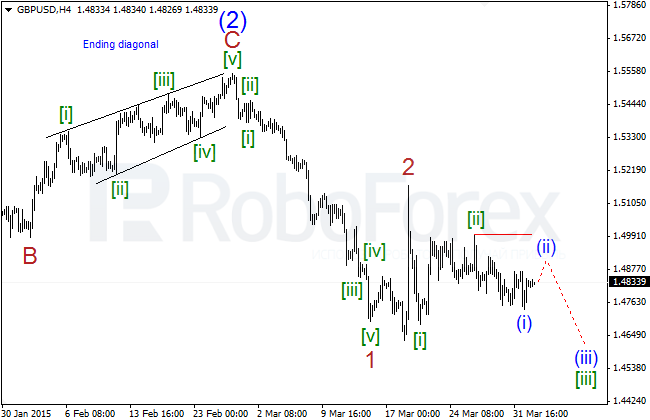 The pattern hasn’t been finished yet, but after it is, the market may start a new ascending movement inside wave 5 of (5) of . 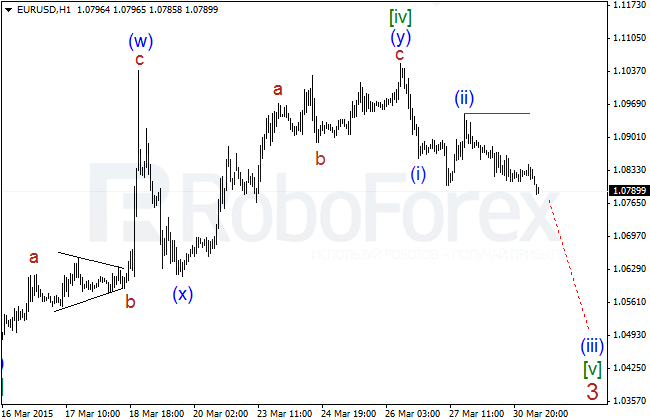 Euro is still falling inside wave (iii) of [v] of 3. 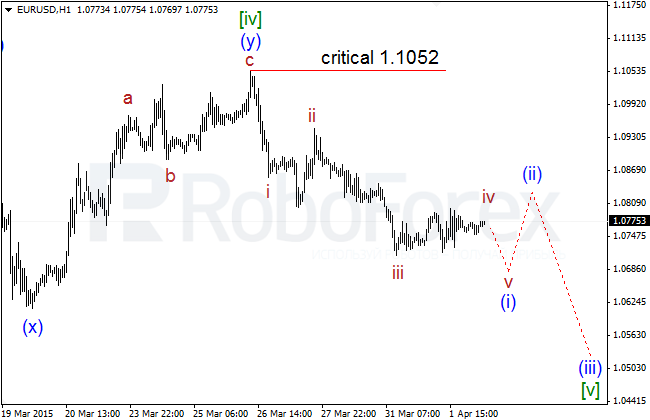 Most likely, in the nearest future, the price will continue falling and stay below 1.0500. 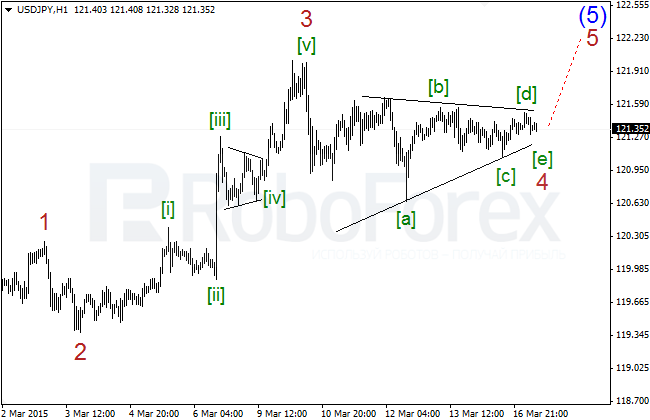 It’s quite difficult to define the structure of the first wave of impulse (iii) of [v], but the pair is falling according to the main forecast. In the future, the market is expected to continue moving downwards. 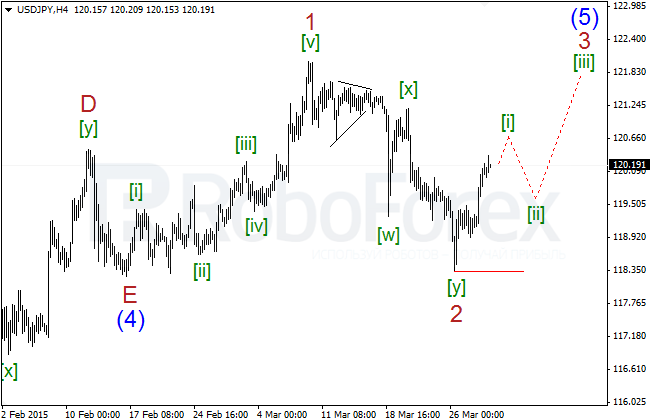 The price is in no hurry to make serious descending movement, that’s why if it doesn’t start moving downwards according to the main forecast (falling inside wave [iii] of 3) in the next 24 hours, I’ll turn to an alternative scenario, which implies that the market may form a more complicated structure inside wave 2 of (3). The market continues falling inside wave (iii) of [iii] and in the nearest future may reach new local lows. Probably, the price is about to finish the first impulse [i] of 3 of a large five-wave ascending structure inside wave 3 of (5) of . 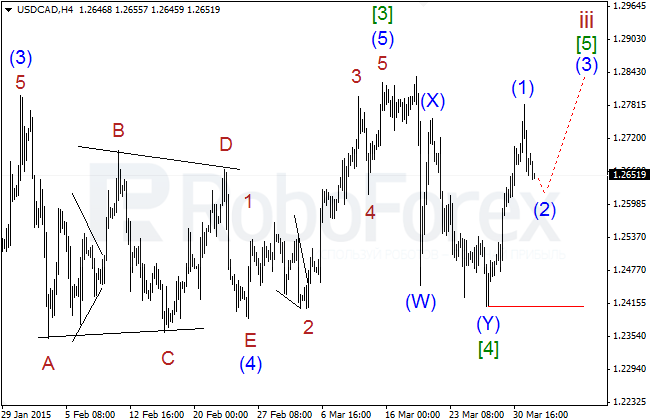 In the nearest future, the pair is expected to complete the first wave and form a descending zigzag inside wave [ii] of 3 of (5). Probably, the pair hasn’t finished wave [i] of 3 of (5), but we expect it in the nearest future. 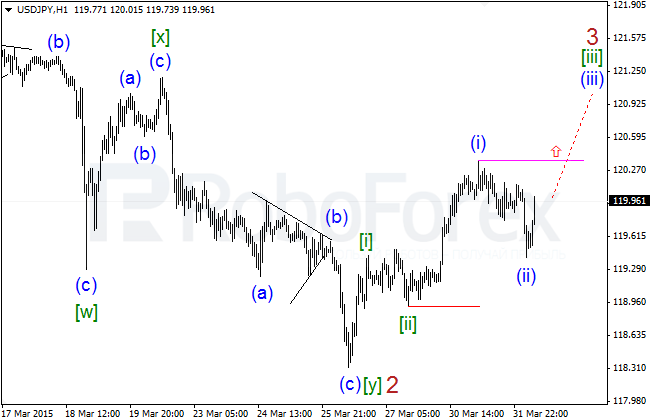 After completing the first impulse, the market may fall towards 119.60 – 120.00 inside wave [ii] of 3 of (5). 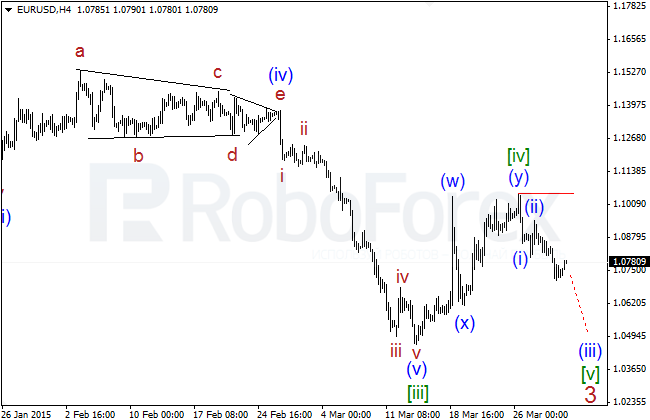 The market continues growing inside wave (1) of . 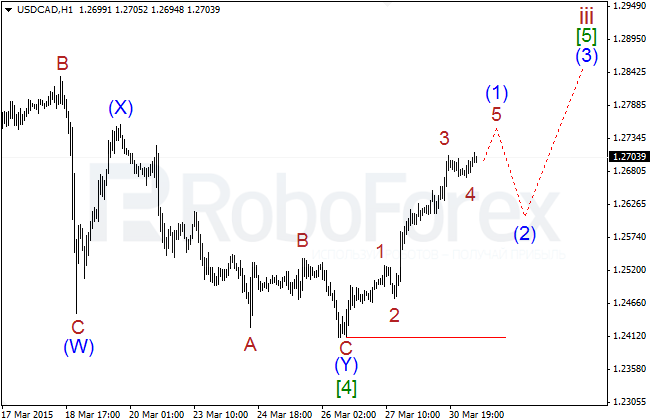 After a short-term correction inside wave (2) of , the pair is expected to start a strong ascending movement inside wave (3) of  towards 1.3000. 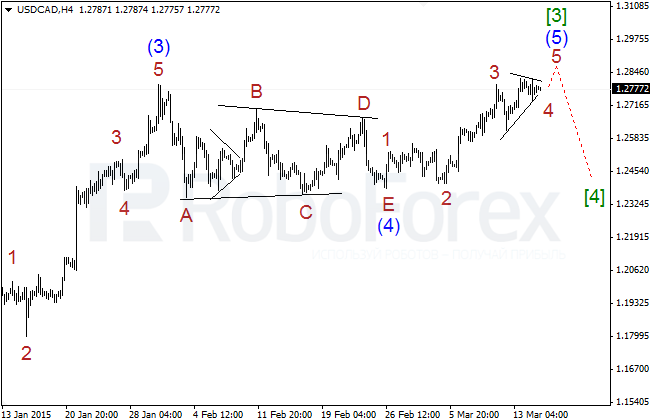 The pair is moving close to 1.2700 and may finish wave (1) of  in this area. 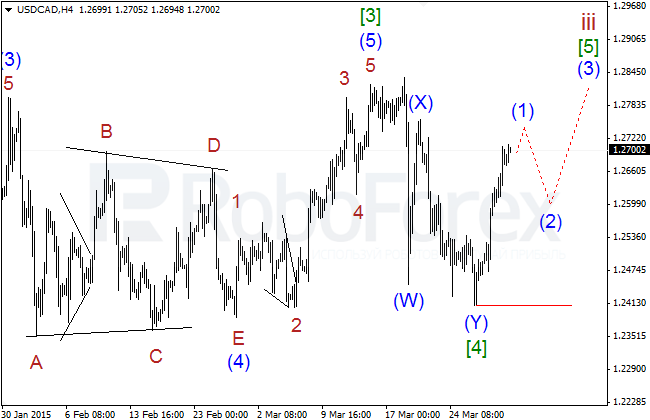 Most likely, after that the market will form a descending zigzag inside wave (2) of . 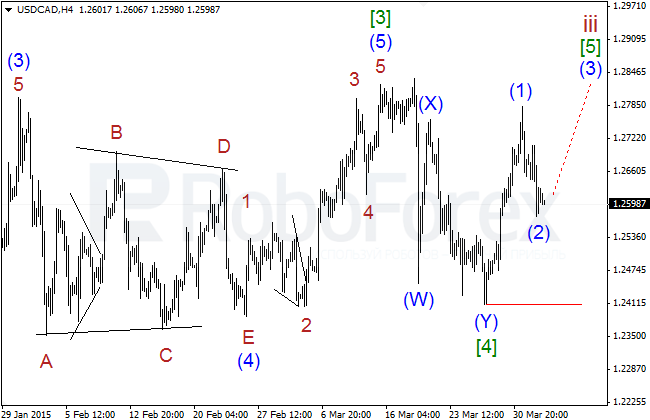 Euro is still forming a large descending impulse inside wave (iii) of [v] of 3. 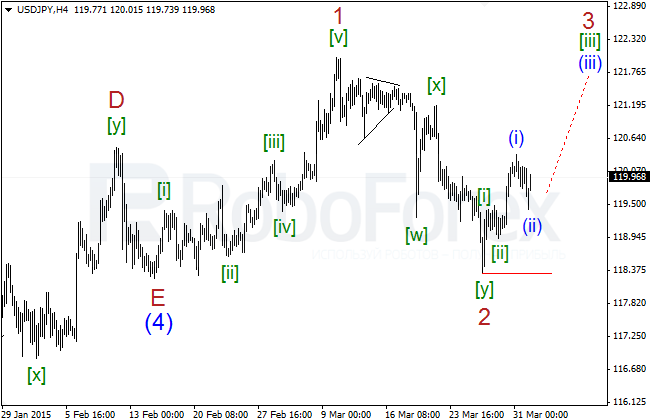 Most likely, in the nearest future, the price will continue reaching new local lows. 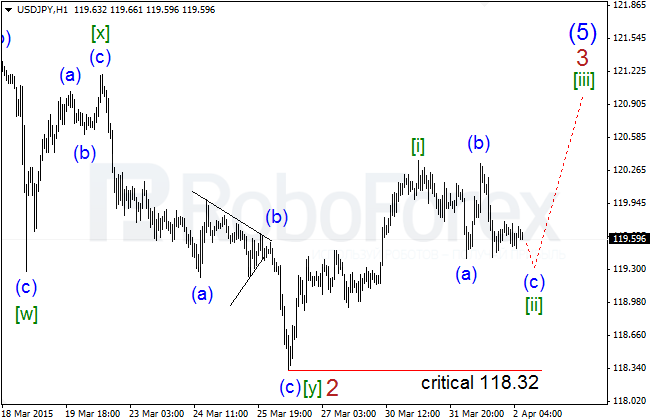 The pair is moving close to its critical level at 1.0948, thus confirming the main scenario, which implies that the market may be forming an extension inside wave (iii) of [v], which may continue in the nearest future. The price is in no hurry to make serious descending movement, but, most likely, it will continue falling inside wave [iii] of 3 in the nearest future. 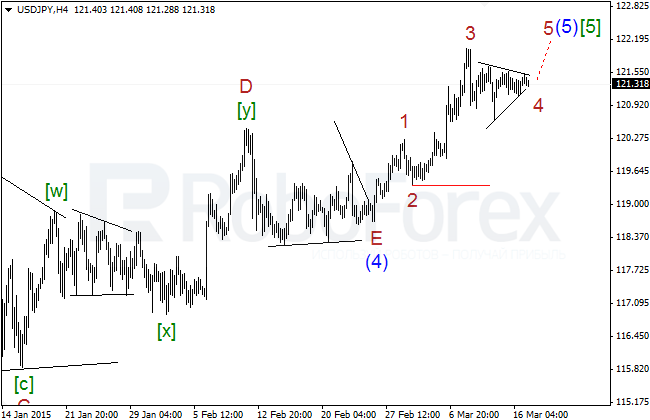 Probably, the market has finished wave (i) of [iii] in the form of leading diagonal triangle and started an ascending zigzag inside wave (ii) of [iii]. Most likely, in the nearest future, the pair may stay below the confirming level (crimson line). 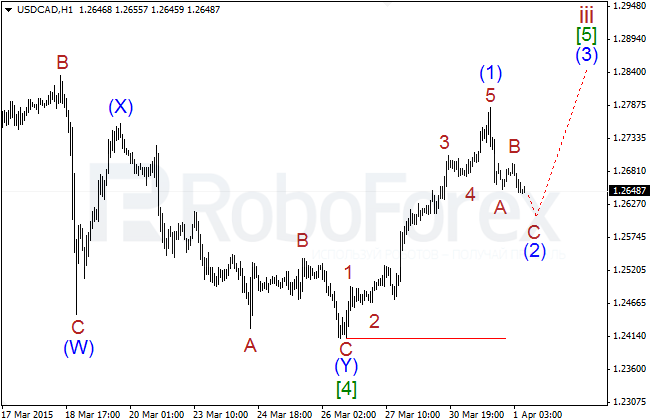 The current descending correction is deep, which means that the price has started forming an extension inside [iii] of 3. Most likely, in the nearest future, the pair will continue growing. Probably, the pair has formed waves (i) of [iii] and (ii) of [iii] of the extension inside wave [iii] of 3. In the nearest future, the price is expected to continue growing and reach new local highs. 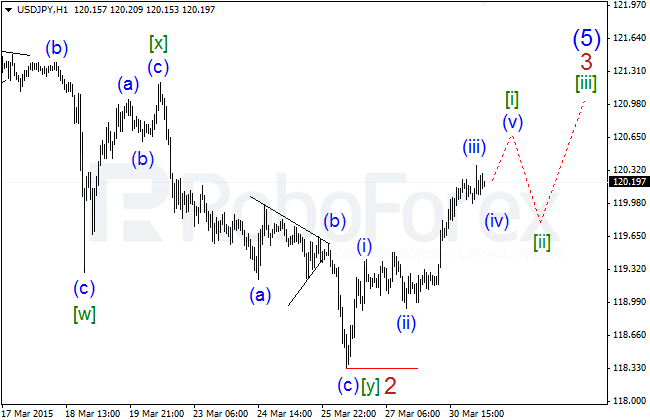 So, just as we expected, the market has finished the first impulse inside wave  of iii. 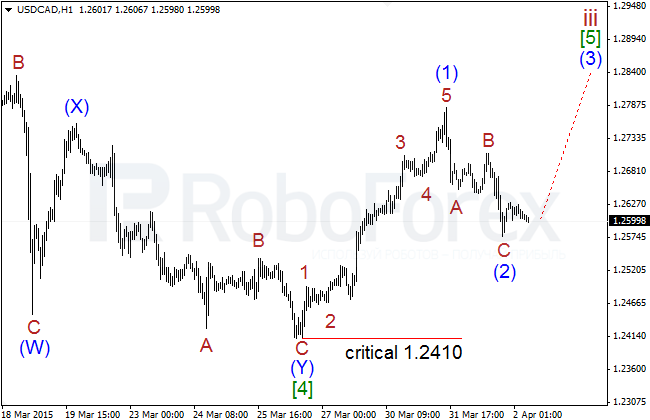 After a short-term correction inside wave (2) of  of iii, the pair is expected to reach new highs above 1.3000.